As a shared bike and pedestrian path, the Outer Circle Railway Anniversary Trail follows the tracks of the old steam era Outer Circle Line. 'Anniversary' was added to the name as part of the commemorations of Victoria's 150th birthday in 1985. The path runs from the Yarra River Trail near the Eastern Freeway at Fairfield to the Gardiners Creek Trail, with 12 signs displaying historical photographs found at significant locations along the way. The Trail was a joint initiative of the City of Boroondara and Parks Victoria. A working group of local residents, local historical societies, railway experts and Council officers decided on the most appropriate locations and photographs for signs, and the content of the captions. We consulted the Public Transport Corporation, the Department of Natural Resources and Environment, Citipower, and Yarra Valley Water. 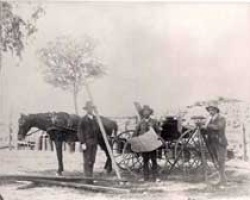 The Department of Infrastructure provided photos, while local historical societies and the Australian Railway Historical Society provided historical information. The Yarra River brick and steel viaduct was built for double tracks (although only one was ever laid) and has three brick and two stone piers between its abutments. These support four steel spans that are 33.5m, three are over land and one is over the Yarra River. The brickwork has bluestone footings and the piers have stone capping. 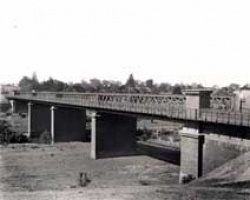 Work on this bridge over the Yarra River at Alphington began in February 1889, but was not completed and tested until November 1890, the same year that the Waverley Road to Riversdale section was opened. Delays on this bridge were a contributing factor to the later opening of the northern sections of the Outer Circle Line in March 1891. John (later Sir John) Monash, the engineer in charge of the Outer Circle Line construction, had a narrow escape during the building of the Yarra viaduct. He was supervising the lifting of heavy stones on the bridge works when a rope snapped and a huge stone dropped close to his head. He recorded the incident in his diary: 'I seemed to live over all my life in a flash. By good luck I was paralysed with a moment's hesitation; had I moved a step it would have been all over with me.' A mason had his hand crushed in the accident. The section of the Outer Circle from Riversdale to Fairfield Park was officially closed on 12 April 1893. To obtain filling for the Collingwood to Jolimont line in 1900, it was reopened temporarily and became the site of the only fatal accident on the line when a train of 16 trucks carrying 52 labourers was derailed and three men were killed. The line was reopened in 1919 from Fairfield Park for goods traffic to APM (Australian Paper Mill) and this portion closed in 1996, although the line can still be seen cutting across Heidelberg Road. The line from the bridge to Princess Street, Kew, was dismantled in 1930 to allow for the building of Chandler Highway. The line from Fairfield Park to Riversdale opened in March 1891 but East Kew Station closed in 1893, after just two years of operation. It was reopened for goods service from 1925 until 1943 while electric trams, which had connected East Kew to the city from 1915, catered for passengers. 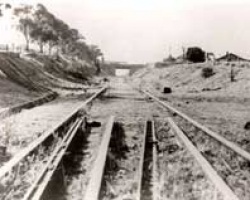 The section of line from the north side of the Yarra to Princess Street, Kew, was dismantled in 1930 to allow the building of the Chandler Highway. The Railway Dismantling Act 1938 authorised the removal of the section between Princess Street, Kew, and East Kew Station. These were removed by June 1940. The photograph shows remains of the Outer Circle Railway looking east from Belford Road towards High Street and was taken in March 1936 before the rails were finally removed in 1940. The tram on the High Street bridge is evidence of how passengers reached the city. The railway cutting and bridge were largely filled and covered when High Street was reconstructed, but part of the bridge nearest to East Kew Station can still be seen on the east side of High Street, near the woodyard. East Kew Station and a goods siding were part of the Riversdale to Fairfield Park section of the Outer Circle line, and opened in March 1891. The station, built on the west side of Normanby Road, closed on 12 April 1893. 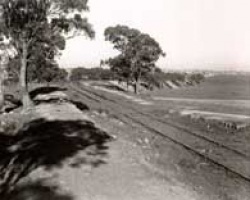 The eastern section of the Outer Circle from East Kew was extensively rebuilt when the line from Riversdale to East Kew reopened for goods traffic on 11 February 1925. 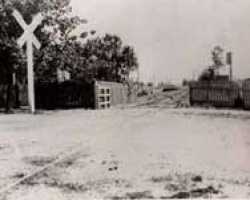 The East Kew goods siding was east of Normanby Road and functioned until September 1943. Bruce Steele remembers this train used to cart firewood and coal for domestic heating to the woodyard which still exists on the right of the line near the Harp of Erin Hotel. The last section of the Outer Circle to be dismantled was between East Kew and Riversdale. The Railway Dismantling Act 1944 authorised this action which was completed by May 1946. The photograph shows a goods train hauled by Loco A2 968 returning from the East Kew goods yard being raced by cyclists on Lady Brasseys Drive, East Kew. Deepdene Station, named after the Deepdene estate which was owned by Mr D.C. Askew, was on the south-east corner of Burke and Whitehorse roads. It opened in March 1891, then closed from 1893 to 1900. 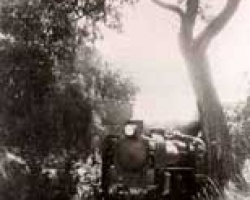 A little steam train — the 'Deepdene Dasher' — plied the line between Deepdene and Ashburton until 29 October 1924. An electric train from Camberwell then took over the trip to Ashburton. 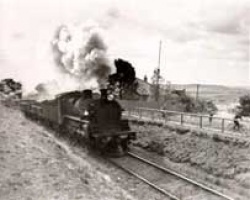 Steam trains continued to run in the northern section between Deepdene and Riversdale with passengers for Melbourne changing trains at East Camberwell. The last steam-hauled Dasher ran on 15 August 1926 and was replaced by two rail motors coupled back to back. On 10 October 1927 the train was replaced by a Railways bus service between East Camberwell and Deepdene, which extended to East Kew in 1929. This photograph is probably indicative of the level of activity on the line. The Riversdale to Fairfield Park section of the Outer Circle Railway opened in 1891 with a series of bridges and road level crossings facilitating the crossing of major and minor thoroughfares. Deepdene Station was to the north of this crossing on Whitehorse Road. The pitched roof of the station building on the eastern platform can be seen above the fence to the right of the photograph with the fenced western platform in the centre of the photograph. The building showing through the trees behind the crossing sign was a railway house, probably the original gatekeeper's residence before the line closed in 1893. There were no gates at Whitehorse Road when the line reopened in 1900 and the train's fireman or guard would go to the crossing with a red flag to stop road traffic and indicate to the train driver when to proceed. A red lamp was used at night. There were compulsory tram stops on either side of the rail line, and the tram conductor was required to disembark, proceed to the crossing and give the all clear to the tram driver to proceed. 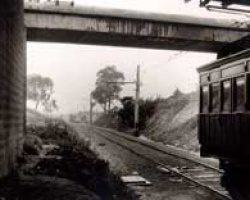 Nonetheless, accidents occurred such as in August 1923 when the last train of the day to Deepdene struck a tram bound for Mont Albert at 11.30pm, and several tram passengers needed treatment for cuts and shock. A special investigation concluded that the driver of the train and the conductor and driver of the tram were guilty of negligence. Shenley Station, to the north of Canterbury Road, was opened on 24 March 1891 when the Riversdale to Fairfield Park section of the Outer Circle Railway was opened. The station was named after the estate of Mr C. Wentworth which was named after Shenley in England. The station originally had two platforms, the main one being on the east side of the line. Blainey recorded that navvies digging gravel in the cutting near Shenley washed up specimens of gold, an event he considered to be the major excitement aroused by the building of the Outer Circle Line. This station was closed from 12 April 1893 until 14 May 1900, and was finally closed on 9 October 1927 when the Deepdene Dasher was replaced by a railways bus service. The photograph shows a wartime goods train heading from East Kew on the goods service run in 1942. The unused Shenley platform and the Canterbury Road overbridge can be seen to the right of the photograph. This photograph of a goods train emerging from the south side of the Canterbury Road overbridge was taken on 15 February 1938 when the line was used only for goods. The Canterbury Road overbridge, to the south of Shenley Station, was a change to the original plans which were to cross Canterbury Road on the level. As a result the existing bridge with brick abutments was built. Embankments leading to the bridge had to be built and Canterbury Road diverted to cross over the line by means of a bridge, thus causing the curve north in the road at this point just east of Broadway. Riversdale Station was named after Riversdale Road, originally Molony's Road, which changed to the same name as the Hawthorn stretch of the road. Riversdale was opened on 30 May 1890 and closed along with the section from Camberwell to Ashburton from 1 May 1897 to 4 July 1898. On 14 May 1900, the northern section of the Outer Circle between Riversdale and Deepdene was reopened. Passengers going to and from Melbourne changed trains at East Camberwell which opened on 14 May 1900. Around 1900, there was an accident at Riversdale when a train ran into a Chinese funeral procession. Fortunately, this caused only minimal injuries. A feature of Riversdale is manually operated boom gates which were installed in 1963, and are unusual because the arms are divided into two sections to enable clearance for the overhead tram wires. A small station, named Golf Links opened between Hartwell and Riversdale on 8 June 1908, primarily to serve the Riversdale Golf Club which moved to this location in November 1907. Club memories record that when the club first opened, members living in Camberwell and Hawthorn (presumably including Percy Russell, club captain in 1906 and 1908 and three times mayor of Hawthorn) would catch the train to Riversdale and walk to the club. Those coming from the opposite direction would do the same from Hartwell. Members did not care for the walk and, due apparently to the influence of president Alexander McNeil of Roystead near Mont Albert Road, a station was built on the line at the nearest point to the club house at the bottom of Stodart Street. It was hardly more than a siding where the train stopped when a red flag by day or a red lamp by night was placed in a signal box by the intending passenger after his golf game! The name was changed to Willison in 1936, the Riversdale Golf Club having departed to a new location in 1927. The 1940s photograph shows a train on the East Camberwell to Ashburton section. The single line, in the foreground, is the Riversdale to East Kew goods line. Hartwell Hill, now known as Hartwell Station, opened later than other stations on the Riversdale to Waverley Road section of the Outer Circle Line on 7 May 1906. It was named after Hartwell House, one of the area's earliest residences built in 1853 by William James Irwin. Hartwell Hill became Hartwell on 1 August 1909 when the nearby original Hartwell Station was changed to Burwood Station. In December 1938, the station was enlarged when the station building from Walhalla, a gold mining town in Gippsland, was brought to Hartwell after the decline of that town led to the closure of the railway line from Moe to Walhalla. This photograph at Hartwell shows construction of the Riversdale to Waverley Road section of the Outer Circle Line in 1889-1890, with Cunningham, Grey and Monash, left to right. John (later Sir John) Monash, although not yet formally qualified as an engineer, was appointed engineer in charge of the Outer Circle Line construction by contractors Graham and Wadick after they won the contract in March 1888. Monash's diary for the 9 April 1888 refers to his first day in the job and a 9am meeting at Dandenong Road to inspect culverts. The first works carried out were earthworks with cuttings being excavated near Ashburton in May 1888. Most of the bridges were completed by the end of 1889. The Waverley Road to Riversdale section was opened on 30 May 1890 and the Riversdale to Fairfield Park section opened on 24 March 1891. Burwood Station, first called Hartwell Station, opened on 30 May 1890. It was named after nearby Hartwell House, the residence of William James Irwin. It was renamed Burwood on 1 August 1909, probably after Burwood Road which took its name from a Hawthorn house (now Invergowrie) built by Dr James Palmer in 1851. Dr Palmer operated Palmer's Punt across the Yarra between Richmond and Hawthorn near the site of the current Burwood Road Bridge. Burwood Station was opened for goods traffic in August 1890, but was closed from May 1897 to July 1898. 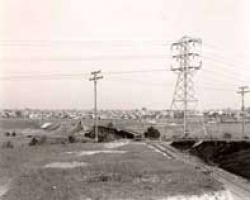 The line was electrified in 1924. 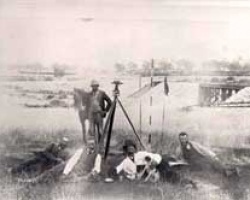 The photograph, dating from the construction of the line in 1890, shows a survey team checking final levels on the section of track near the Norwood Road (now Toorak Road) Bridge. Photographed are Inspector Thompson from the Victorian Railways and Mr Shaw and members of the contracting company of Graham and Wadick who were responsible for the construction of the Outer Circle Line. Norwood Road can be seen extending east under the railway bridge in the middle distance from the left of the photograph. Hazards on the railways were different in those days. Frank Mason whose father used to travel to work on the Outer Circle Line tells the story of an accident-prone driver whose worst accident was knocking four horses off the railway bridge at Toorak Road onto the road beneath! Ashburton Station, 5km from Oakleigh and 11km from Fairfield, was opened on 30 May 1890 to the north of High Street under the name of Norwood, taken from Norwood Road (now Toorak Road). The station was renamed Ashburton in December 1890. It had a loop on the west side of the line and a dead end siding at the Camberwell end of the station. The two platforms together with the siding arrangements indicate that heavy passenger traffic was expected on this section of the Outer Circle. Ashburton became the southern terminus of the Outer Circle Line in 1895 when the Ashburton to Oakleigh line was closed. The Camberwell to Ashburton section was closed on 1 May 1897 but reopened on 4 July 1898. This section was electrified on 30 October 1924. Goods trains ceased in 1954. The photographs present two different images of Ashburton Station. In one an electric swing door suburban passenger train is under the High Street Bridge during off-peak running in 1940 while in the distance a single carriage train waits at Ashburton Station. In the other, dated around 1900, a suburban well tank loco prepares for the trip north to Deepdene with staff and admirers posing for the camera. The first section completed of the Outer Circle Line was the section from Waverley Road to Riversdale Station which opened in May 1890 and went north through the Ashburton area. The Ashburton to Waverley Road section was closed in December 1895 and the Railway Dismantling Act of 1938 authorised the removal of lines between Oakleigh to south of Ashburton Station. These tracks were dismantled by June 1940, presumably around the same time that the Black Bridge was sold for scrap. An electric train from Camberwell terminated at Ashburton Station from 1924. The line was extended and electrified for less than a kilometre to Alamein Station which opened on 28 June 1948 to serve the nearby housing commission estate. The station was named after the North African battlefield of World War II in keeping with names given to streets in the housing estate. Today, the only functioning remnants of the ill-fated Outer Circle Line are the few stations along the Alamein line. The photograph, dated about 1940 but before the line was taken up, shows the railway line cutting through Ashburton Forest. The Outer Circle Line left the Gippsland line near Poath Road and the current Hughesdale Station with the first station on its line being Waverley Road. The Waverley Road to Riversdale section of the Outer Circle Line opened on 30 May 1890, with the Black Bridge spanning Gardiners Creek. This single line timber bridge with 31 spans each 4.5m long was built in 1889, and probably received its name due to the coating of black tar which covered its piles. The Waverley Road to Ashburton section of the Outer Circle Line closed in December 1895. This photograph from between the wars shows the line leading south to the Black Bridge from Ashburton. 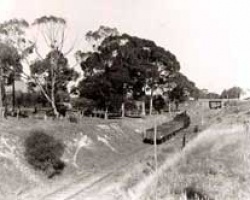 The cutting for the East Malvern to Glen Waverley line which went through in 1930 can be seen in the embankment to the left of the Black Bridge and East Malvern Station with a passenger train can be seen at the extreme right of the photograph. During an inspection in 1932 of the unused section between Ashburton and Oakleigh the long timber trestle bridge was found to be virtually intact apart from having a few planks missing in the top deck at rail level and some minor fire damage to three base supports. The bridge was sold for its wood content at the beginning of World War II for 500 pounds, though remains of a timber pylon can still be found on the north bank of Gardiners Creek. Learn more about the history of the area from the resources listed on research your local history.